As you work in agricultural development, there may be times that you find yourself wondering about the answer to a specific question you have. For example, should plants be spaced 30 cm or 60 cm apart to achieve the highest yield? Which one of three tomato cultivars would grow best in a particular area? Would growing a cover crop in the off-season result in higher corn yields? Once you decide on a particular question that you want answered, several steps can (and should) be taken. These steps will make the best use of your time and efforts while giving you the most confidence in your outcome. 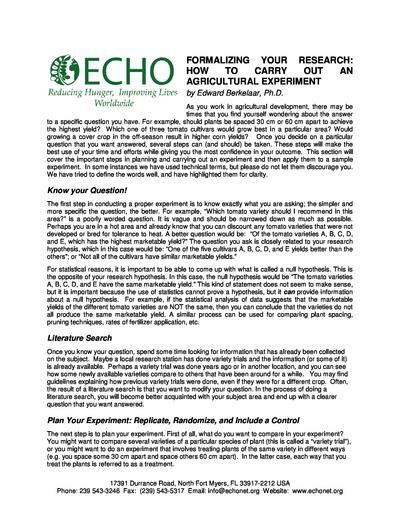 This section will cover the important steps in planning and carrying out an experiment and then apply them to a sample experiment. In some instances we have used technical terms, but please do not let them discourage you. We have tried to define the words well, and have highlighted them for clarity.